The 2016 Presidential Election: How Will Markets Be Affected? In 2000 and 2008, the last two elections where we knew we were getting a new president, markets were in the midst of a downward correction. In November 2000, the S&P 500 was three months into the Dotcom bubble correction that wouldn’t bottom out for almost another two years. Similarly, in 2008, the S&P was one year into the financial crisis that wouldn’t hit bottom for another four months. Investors are fortunate enough to not have experienced any such bad luck since then. American markets are trading at market highs, and aren’t defined by any one sector, or a highly leveraged consumer. Fiscal policy is still very accommodating, with interest rates at historical lows. Anthony – What Happens If Clinton Wins? The research shows that since the 1950’s, whichever candidate leads the polls in October usually goes on to become president. Going by this trend, it seems Hillary Clinton has the better chance of winning the election. The Republicans are expected to maintain control over the Congressional House of Representatives. This “status quo” outcome would have lesser economic and market impact. 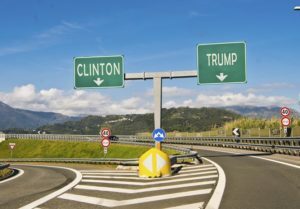 Two major policy actions of a Clinton presidency could benefit the economy: changes in corporate tax laws to promote repatriation of corporate profits held overseas to fund infrastructure spending, and immigration reform. Both of these could garner bipartisan support and have a high possibility of enactment. Possible risks to business of a Clinton win include executive orders on drug pricing, antitrust enforcement, and restrictions on fracking for domestic oil & gas production. Inflation and interest rates will likely remain lower for longer. Frank – What Happens If Trump Wins? As Anthony astutely points out, there is no historical evidence in favour of either a Republican or a Democrat presidency, in terms of the effect on the markets. However, the prospect of a Donald Trump presidency does introduce one key variable into the equation: uncertainty. Opting out, or “ripping up” of NAFTA, and other free trade agreements, could hurt emerging markets (e.g. China, Mexico, etc) who have benefitted greatly from free trade with the U.S. Trump’s intention to put America First could lead to a shift away from globalization and would represent a risk to all asset classes, at least in the short term, similar to the market corrections post-Brexit. Introducing stiff tariffs would have the effect of increased prices of goods, leading to lower discretionary income for Americans. This would naturally lead to decreased spending on entertainment, luxury items, etc. Increasing government spending on the military and on infrastructure could be bad for the bond market. A Clinton presidency would certainly offer – in many ways – a “status quo” for the economy and the markets. There would be little chance of serious reform or change, as a projected Republican-controlled House would work to oppose Mrs. Clinton’s policy reform bills. As far as the markets go, they’d likely continue to be unaffected in any meaningful way in the long term. This would continue the historical trend of economic cycles ebbing and flowing independently of the Presidential election winner. Trump, on the other hand, would be the more unpredictable president, and the uncertainty surrounding many of his platform policies could have a negative affect on the markets for an unforeseen length of time. In the long term – regardless of the outcome – markets historically have shown resiliency and eventually adapt to the events at hand.